Please Note: Because Stelle is such a small town we have a Cabery post office address (60919). Midwest Permaculture is a residence located in Stelle, located about 5 miles SE of Cabery. Most internet map services no longer have trouble finding Midwest Permaculture and giving good directions but if you would prefer, we have written directions below. You might print them out before heading out…!!! Take the Chebanse exit #302 (there’s only one). Go to the top of the ramp and turn right. Go one block to stop sign and make another right turn (the RR tracks will then be on your left). Go two blocks to the next stop sign and make a left turn. This street will take you over the tracks and straight through town. Stay of this road (due west) for about 10 miles until you come to your first stop sign since leaving Chebanse. This is 200E Road. Turn left (south) and travel 3 miles to 3100N Road. Turn right (west) and go 3 1/4 miles to Stelle. Turn left into the entry (two landscaped STELLE signs). Take the Ashkum exit (293) and travel west on Rt. 116 for ~6 miles to the Herscher/LaHogue road. (Look for the sign.) Turn right toward Herscher and go north 5 miles. Turn left on county road 3100 N (twin blue silos across intersection from it) and head west 3 1/4 miles to Stelle. Turn left into the entry (two landscaped STELLE signs). Exit at #197 for Pontiac. Travel east on Rt. 116 through Pontiac. Watch the signs as Rt.116 turns a bit through town. Continue east on Rt. 116 about 15 miles through the town of Saunemin (after crossing Rt.47) and another 5 miles through the town of Cullom. 3 miles out of Cullom you will come to the Rt. 115 intersection. Go straight through this intersection for 2 more miles to 1600 E. Turn left and go north for 5 miles to 3800 N. Turn right on 3800 N and go 3/4 miles east to Stelle’s entrance on the right. Turn right to enter by the two landscaped STELLE signs. Travel east out of Dwight on Ill. Rte 17. When ~2 miles past the small town of Reddick (~10 miles east of Dwight), turn right (south) at the sign for Cabery. Travel about 8 miles to Cabery and continue on for three more miles until you reach 3800 N road. 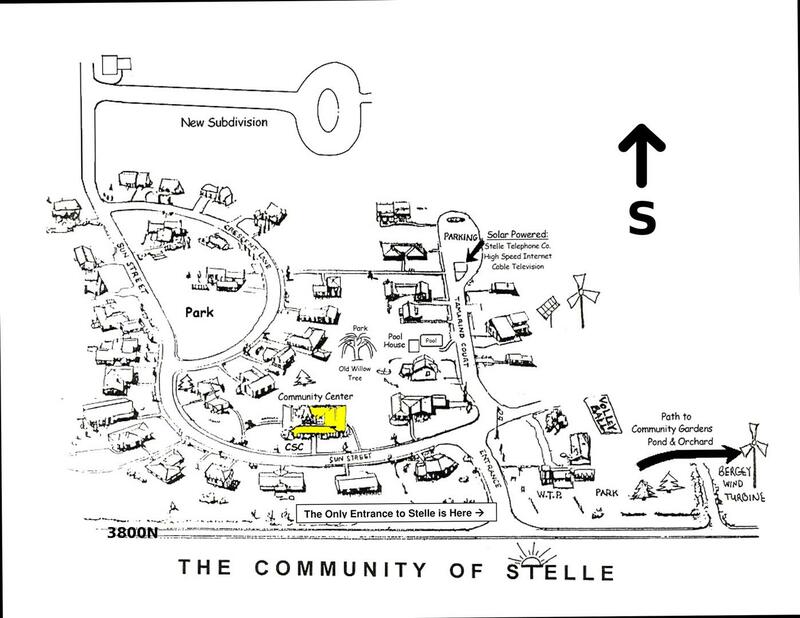 Turn left (east) on 3800 N road and travel for 2.75 miles where you will find the entrance to Stelle on the right. Turn right to enter by the two landscaped STELLE signs.